Global industrial manufacturers are still off from their highs, but they've also rebounded from their lows. Global industrial conglomerates Eaton Corp. (NYSE:ETN), Emerson Electric (NYSE:EMR), and ABB (NYSE:ABB) are all off around 20% or so from their late 2014 peaks, suggesting they remain out of favor as the market hovers near all-time highs. 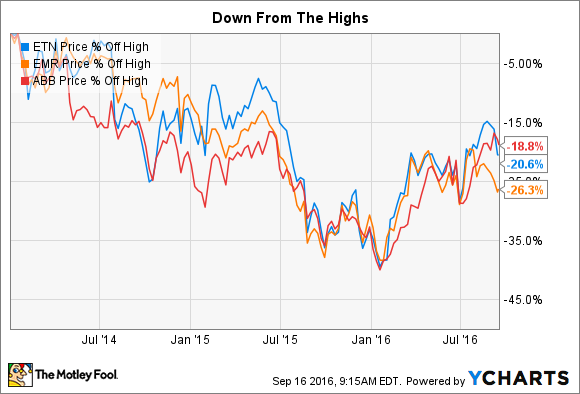 But they've each rallied off of deeper losses...are these three beaten-up dividend stocks still bargains? The first thing you need to know about the industrial space is that things are rough right now. For example, Eaton is expecting its organic sales to decline as much as 4% this year while Emerson is looking for underlying sales to fall up to 6% in fiscal 2016. Looking backward, ABB's 6% year-over-year top-line decline in the first half and 9% order decline is good example of what's going on throughout most of the industrial space. Simply put, it's tough right now for ABB, Eaton, and Emerson. So there's a good reason why the shares of these companies are down roughly 19%, 21%, and 26%, respectively, since early 2014. That said, despite the difficult environment, the trio is still making plenty of money. For example, in the most recent quarter, ABB posted earnings of $0.19 a share, Emerson earned $0.74 a share, and Eaton made $1.07 a share. Lower year over year, in each case, but a far cry from red ink. That said, none of these companies is predicting a business upturn anytime soon. Comparable results might get easier, but robust growth doesn't appear to be in the cards right now. In fact, Emerson recently noted that based on the current market and other moves its making, it only expects to increase its dividend by $0.02 a year through 2021. That's not exactly the most positive of outlooks. Moreover, each company is working hard to restructure to better deal with the current environment. Eaton, for example, is spending $140 million to streamline its business, which it hopes will lead to $190 million in annual savings on an ongoing basis. ABB is working on its "next level" strategy, and is currently looking to optimize business functions and shared services, as well as reduce organizational complexity, targeting areas like finance and human resources. The goal is productivity savings of $400 million. Emerson, meanwhile, is probably taking the most aggressive actions. It's selling its network power business for $4 billion and buying Pentair's (NYSE:PNR) valves and controls business for $3.15 billion. Network power has proven to be a lower-margin business than hoped while the valves and controls' business will strengthen Emerson's higher-margin automation business. The expectation, of course, is that overall profitability will be better after the changes. What about the price advance? So, in some ways, you can look Eaton, Emerson, and ABB, which are still well off their highs, and see opportunity despite the difficult market environment. However, you need to juxtapose that against the fact that they've risen materially from their mid-January lows. ABB has led the advance, rising nearly 37%. Eaton is close behind at a nearly 32% climb. And Emerson is in the rear with an advance of only 20% or so. And despite a recent pullback, each is still up more than the S&P 500 so far this year. What gives? Part of the answer is the low interest rate environment pushing investors into dividend-paying stocks in a search for income. The yields on each of these companies was close to or above 4% at the start of the year. Even after the advance, their yields are still decent, with ABB at around 3.4%, Eaton at 3.6%, and Emerson at nearly 3.7%. 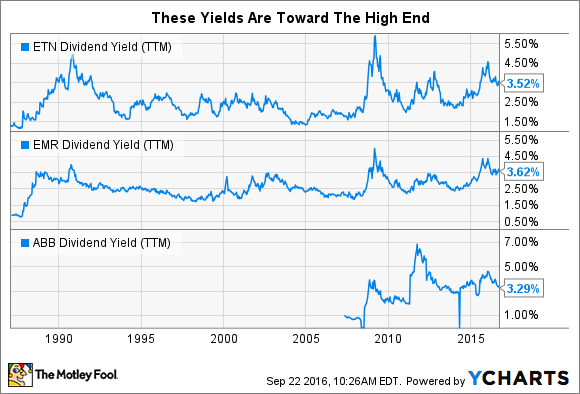 But here's the key: If you are a long-term investor, those yields are not nearly as good as they were earlier in the year, but still hovering near the high end of their historic ranges for Eaton and Emerson. ABB's yield is much less enticing compared to its history. So ABB, Eaton, and Emerson are still three beaten-up dividend stocks. But are they bargains? The first answer is they aren't nearly as cheap as they were just a few months ago. However, Eaton and Emerson still look like decent deals, if you intend to own them for a long time. ABB, meanwhile, is probably the least desirable of the group for dividend investors right now based on its recent price and yield. That said, Emerson's major business moves likely pose the most risk, since large mergers and acquisitions sometimes turn out to be more problematic than they're worth. The higher yield offered, though, might make up for that. At the end of the day, it looks like this trio is likely to face a tough market next year, too. So the price of Emerson and Eaton today isn't bad, but there could be better opportunities ahead if they continue to struggle with weak end markets.